A phone charging kiosk with lockers or a portable charging system is the perfect way to satisfy customers and improve your business or event. Veloxity’s charging solutions are easy to use and charge virtually all smartphones with portable chargers or inside secure lockers, freeing your customers from dead battery anxiety. Customers and guests with low or dead battery tend to get anxiety and will leave your establishment early. By providing a charging kiosk from Veloxity, your venue will have the ability to keep customers for longer and spending more. Charging solutions have become so essential that with proper promotion a business can increase foot traffic to their venue with a Veloxity charging kiosk. Customers with low or dead battery will seek out your venue for a source of power. Each of Veloxity’s phone charging kiosks have an LCD screen that acts as a branding platform for your business or sponsors. With customers engaged in the charging kiosk the LCD screen becomes a powerful advertising opportunity. Each phone charging solution offers unique custom branding options. The LockerPower has a display screen for videos or images. The kiosks can be further branded with custom wraps. 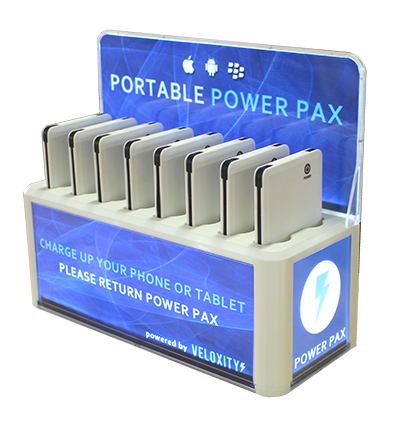 The Power Pax offers custom branding on the charging bay and individual power packs. Veloxity’s phone charging stations are available for rent or purchase. Veloxity Canada provides phone charging kiosks and cell phone charging stations to venues and events across Ontario, Quebec, British Columbia, Alberta, Nova Scotia, and other provinces. Our universal charging solutions have been popular at trade shows, universities, schools, hospitals, conferences, conventions, and other commercial venues. 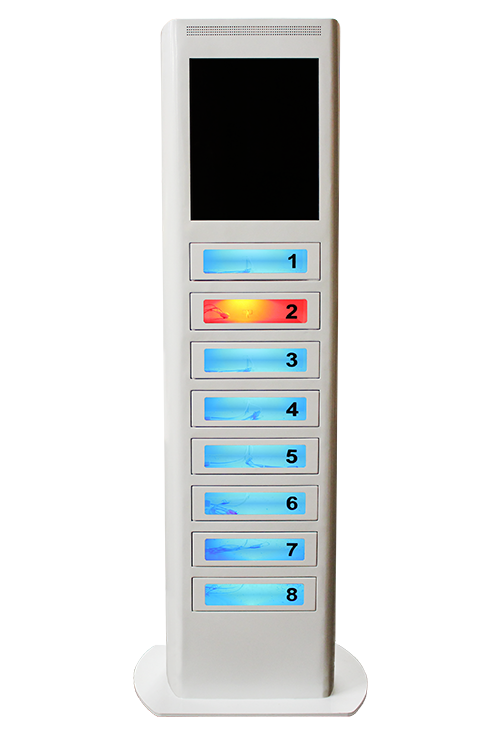 Our phone charging kiosks with lockers are available for purchase, lease, or rent. Each kiosk has an LCD touch screen that offers a unique advertising or sponsorship platform. Buy or rent our cell phone charging stations in Vancouver, Montreal, Toronto, Quebec City, and other cities in Canada. Contact us today! Veloxity Canada provides cell phone charging kiosks across the country. | Copyright © 2015 Veloxity Technologies Inc. All rights reserved.